A great little Pinot Noir. 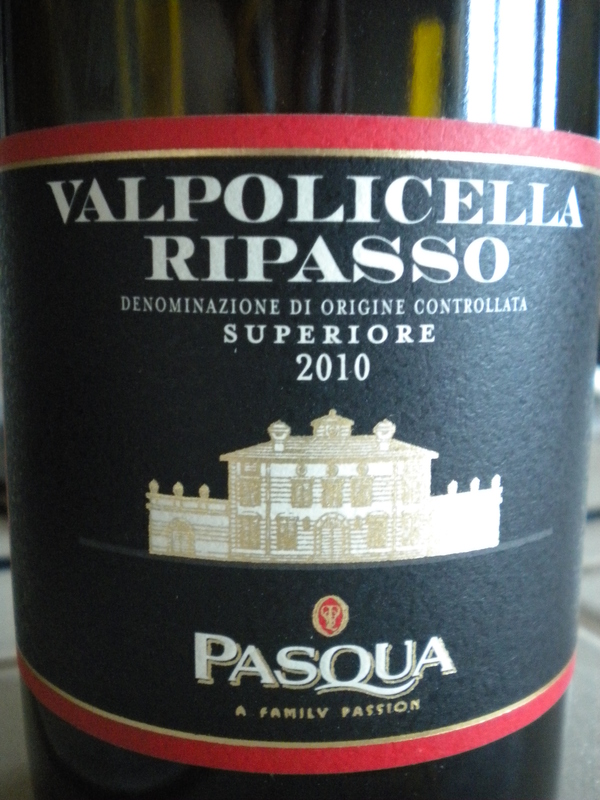 Lovely light ruby color, with nose of cherries, vanilla, strawberries and tea leaves. Very nice finish and enjoyable bouquet. 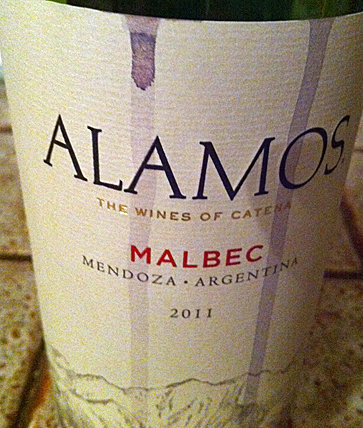 We were very pleasantly surprised, but then we did like this brand’s Cabernet Sauvignon too. A really good deal. Terrific with roast chicken. Would go well with spanakopita, paella, a hearty bean soup, cheese and bread. 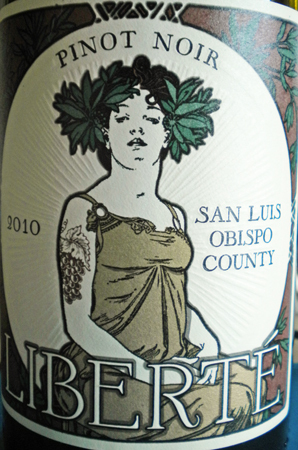 First, a bit of information: Cabernet Franc is a lesser known grape used in California wines. A thin-skinned red grape that grows particularly well in cooler climates originally from the Bourdeaux and Loire Valley regions of France, the Cabernet Franc has been grown with success in France, Australia, Chile, Canada, South Africa, California and Washington, producing a fruity wine that is softer and more subdued than its regal relative, Cabernet Sauvignon. With fine tannins,spicy aromas, peppery accents, violet nuances and an understated elegance plus some serious red and black berry (mainly blueberry, raspberry and sometimes plum) flavor, Cabernet Franc is an ideal candidate for blending with other varietals such as Merlot and Cabernet Sauvignon. However, more producers are selling Cabernet Franc as a stand alone, single varietal on merchant shelves with notable success. 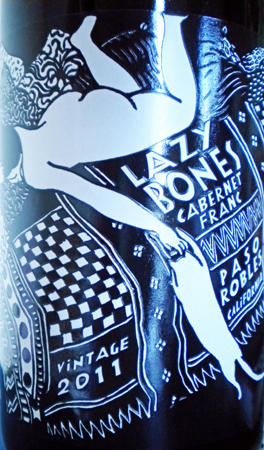 The Lazy Bones 2011 Cabernet Franc from Paso Robles, may need some aging as it begins with all the expected nose and tasty fruit but then flattens out and by the second glass is unremarkable. I can see why this grape is used in the blend of grapes that makes a Bordeaux, it helps with the softness. 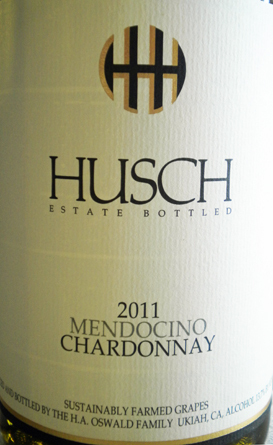 There is a lack of complexity in this particular wine, even though it is easy to drink. A bit disappointing. I loved the label of this bottle and the cork even had a picture of the cat, all curled up, which I found adorable. For the price it is okay, but not great. 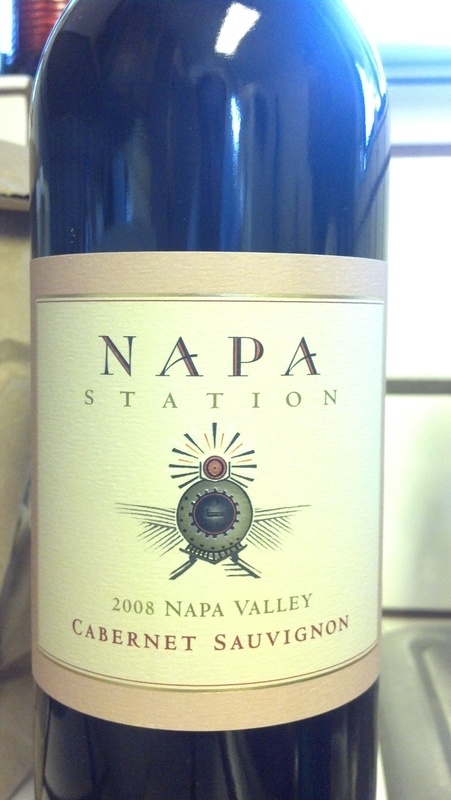 We tasted the Napa Station Cabernet Sauvignon tonight and I believe that if you are looking for a pure Cabernet Sauvignon, this is not your wine. However, if you are looking for huge fruit, berries, plums, dried sweet cherries, etc. ; you will be in heaven. Not bad for a ten dollar red. In my/our opinion this wine is mis-named; it should be called meritage or quadruple-tage or something to that effect as it actually is made from four grapes. We have your Cabernet Sauvignon, your Merlot, your Malbec and then your Pinot Verdot. Yes folks, this is a Blend. Okay, so we are clear on this point. Now we must come to terms with what the vintners were attempting to create here. As we mentioned previously it is a fruit bomb. There is really no other way to say it. Sorry to be blunt, but we are here to review, not to make “nice”. Tannins are virtually non-existant, yet it is easy to drink and goes down quite smoothly. It is not super sophisticated but pleasing. Like a Sundae, delicious, not too memorable. However, truth be told, I will buy it again. I loves me some big fruit. (Forgive me for the horrible grammar). I found out that it is at TJ’s for a limited appearance, so if you’re into HUGE fruit and not too rigid about tannins, I’d say go for it. It’s kind of like a lumbering Zin. Friendly, not too demanding. I had a boyfriend like that once. 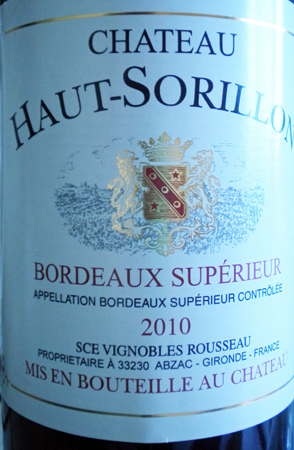 A very rich and delicious Bordeaux. This Bordeaux had more body than I’ve experienced before, and we loved it. It has a wonderful nose, plummy and woodsy, not too much “cigare volante”*. Note to wine lover: Open this bottle pour a glass for yourself and a friend or two and let it breathe for about 40 – 60 minutes. It needs to get used to itself. Red Bordeaux are created with Cabernet Sauvignon, often blended with Cabernet Franc and Merlot. The color tends to be a garnet/ruby shade. The flavor is typically a light one, with blackberry, black fruits, wood, and other notes. A classic Bordeaux is said to have a *”cigar box” aroma to it. Really unbeatable for the price. Wonderful with roast chicken, meats, rich pasta dishes, and even robust Thai food. A really spectacular Pinot Noir in my opinion. It is strong in the berry flavors and bright notes peculiar to PN, well balanced in acidity and sugars, this wine also carries a weight and full mouth feel that may remind you of a traditionally bigger grape like a Cabernet Sauvignon, Merlot, Zinfandel or Grenache. 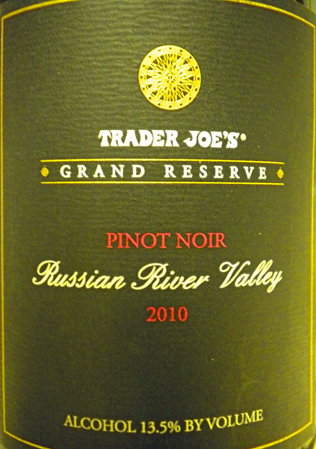 These Trader Joe’s Reserves continue to surprise me with the quality, depth and fantastic flavor of their Reserve wines. Don’t be afraid to try them just because they have the Trader Joe’s name. Had this last night with pork tenderloin and it was absolutely wonderful! You may be unfamiliar with the Grenache grape, but it is one the most widely grown Rhone varietal grapes in the world. 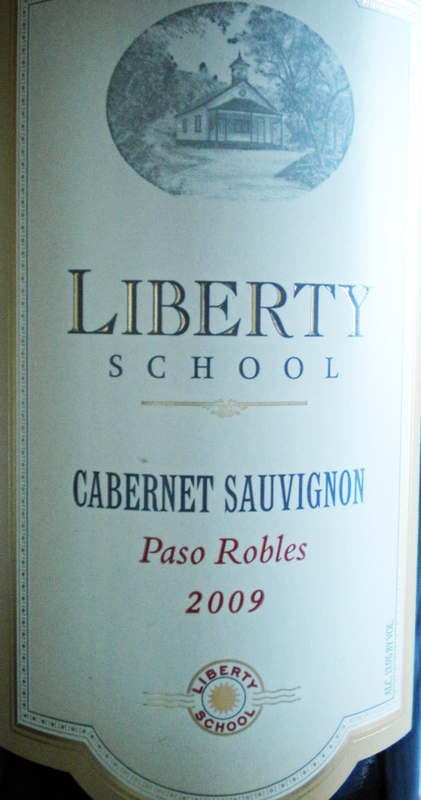 It is spicy, berry-flavored and soft on the palate with a relatively high alcohol content. It’s good to be adventurous and try this rich, full, berry, vanilla, hint of leather, spice and cherries wine. It comes out of the bottle pretty light, like a Pinot Noir but packs a huge flavor. Grenache is the dominant variety in most Southern Rhônewines, especially in Châteauneuf-du-Pape where it is typically over 80% of the blend. In Australia it is typically blended in “GSM” blends with Syrah and Mourvèdre. 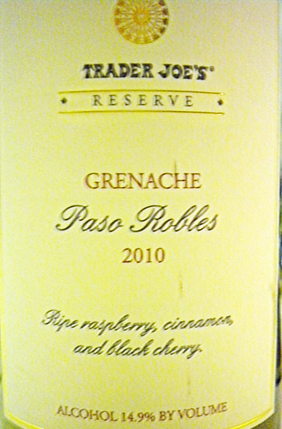 Grenache is also used to make rosé wines in France and Spain, notably those of the Tavel district in the Côtes du Rhône. And the high sugar levels of Grenache have led to extensive use in fortified wines, including the red vins doux naturels of Roussillon such as Banyuls, and as the basis of most Australian fortified wine. Not overly Oakey or clunky. Lots of refreshing citrus and tart pineapple and green apple flavors. Excellent mouth feel and clean finish. Highly recommended. Had it with salmon and seaweed salad, a definite repeat in the near future.